The term “bad trip” is commonly used to describe a disturbing psychedelic experience, yet anecdotally such experiences can have negative and positive consequences. To better characterize “bad trips” associated with psilocybin mushrooms use, and to compare results to clinical studies of psilocybin, the Johns Hopkins Psilocybin Research Project conducted an online survey of nearly 2000 participants who endorsed having a psychologically difficult or challenging experience after consuming psilocybin mushrooms. This talk will present these results and discuss their practical significance, including identified factors that can be modified to reduce risks associated with psychedelic use. Darrick May, M.D., is an addiction psychiatrist and Post-doctoral Research Fellow at Johns Hopkins University. 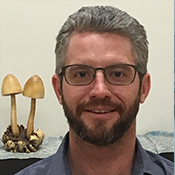 Under the primary mentorship of Roland Griffiths, Ph.D., Dr. May has been involved in the development of hallucinogen protocols including a pilot study examining the potential antidepressant effects of psilocybin in people with treatment-resistant depression, and has been a session guide and physician monitor on multiple ongoing psilocybin studies. Dr. May completed psychiatry residency at the University of Washington and an addiction psychiatry fellowship at the University of New Mexico. While at UNM he was a sub-investigator on a psilocybin for alcohol dependence trial being conducted by Michael Bogenschutz, M.D. Additionally, Dr. May is a therapist adherence rater and is completing therapist training for MAPS’ MDMA for PTSD studies.